Ben Jonson. Jonson, Benjamin, photograph. Public Domain. An Anachronistic War Hero Finds Trouble with the Law. Jonson was born in London shortly after the death of his father, a minister who claimed descent from Scottish gentry. Although his family was poor, he was educated at Westminster School under the renowned antiquary William Camden. He apparently left school unwillingly when called to work with his stepfather as a bricklayer. He then served as a volunteer in the Low Countries in the Dutch war against Spain; reportedly, he defeated a challenger in single combat, stripping his vanquished opponent of his arms in the classical (and by that point quite anachronistic) fashion. The war Jonson fought in was a part of the bloody European wars of religion, in particular, the Eighty Years’ War (1560s-1648)—in which the increasingly Calvinist (a particularly stern version of Protestantism) Netherlands fought to throw off the yoke of Catholic Spanish rule. Jonson’s participation reflected the strong anti-Catholic sentiment that had prevailed in England since King Henry VIII’S break with the Vatican in 1533, with the notable exception of the reign of Queen Mary I from 1553 to 1558. Jonson returned to England by 1592 and married about three years later. It seems that the union was unhappy and produced several children, all of whom Jonson outlived. In the years following his marriage, he became an actor and also wrote numerous ‘‘get-penny entertainments’’ (financially motivated and quickly composed plays), as well as working on emendations and additions to Thomas Kyd’s The Spanish Tragedy (1592). By 1597 he was writing for Philip Henslowe’s theatrical company. That year, Henslowe employed Jonson to finish Thomas Nashe’s satire The Isle of Dogs (now lost), but the play was suppressed for alleged seditious content and Jonson was jailed for a short time. In 1598 the earliest of his extant works, Every Man in His Humour, was produced by the Lord Chamberlain’s Men with William Shakespeare—who became Jonson’s close friend—in the cast. That same year, Jonson fell into further trouble after killing actor Gabriel Spencer in a duel, narrowly escaping the gallows by claiming benefit of clergy (meaning he was shown leniency for proving that he was literate and educated). ‘‘War of the Theaters’’. Shortly thereafter, writing for the Children of Queen’s Chapel, Jonson became embroiled in a public feud with playwrights John Marston and Thomas Dekker. In Cynthias Revels (1601) and Poetaster (1601), Jonson portrayed himself as the impartial, well-informed judge of art and society and wrote unflattering portraits of these men, who counterattacked with a satiric portrayal of Jonson in the play Satiromastix; or, The Untrussing of the Humorous Poet (1602). This brief dispute became known as the ‘‘War of the Theaters’’; interestingly, scholars speculate that the dispute was mutually contrived in order to further the respective authors’ careers. In any event, Jonson later reconciled with Marston and collaborated with him and George Chapman in writing Eastward Hoe (1605). A joke at the king’s expense in this play landed him once again, along with his coauthors, in prison. Once freed, however, Jonson entered a period of good fortune and productivity. He had many friends at court, and James I valued learning highly—in a society where most art depended heavily on the patronage of the wealthy and powerful, this meant quite a bit. Jonson was frequently called upon to write his popular, elegant masques, such as the Masque of Blacknesse (1605). During this period, he also produced his most successful comedies, including The Alchemist (1610) and Bartholomew Fayre (1614). Self-Proclaimed Poet Laureate. In 1616 Jonson published his Workes, becoming the first English writer to dignify his dramas by terming them ‘‘works,’’ and for this perceived presumption he was widely ridiculed. In that year, Jonson assumed the responsibilities and privileges of Poet Laureate, though without formal appointment. From 1616 to 1625 he primarily wrote masques for presentation at court, collaborating frequently with famed poet, architect, and stage designer Inigo Jones. Misfortune, however, marked Jonson’s later years. A fire destroyed his library in 1623, and when James I died in 1625, Jonson lost much of his influence at court, though he was named city chronologist of London in 1628. Later that year, he suffered the first of several strokes that left him bedridden. Meanwhile, Jonson’s collaborative relationship with Jones grew strained as the latter’s elaborate theatrical spectacles increasingly overshadowed Jonson’s dialogue and songs, and in 1631 the two parted ways. Jonson produced four plays during the reign of Charles I, but none of these was successful. The rest of his life, spent in retirement, he filled primarily with study and writing; at his death, two unfinished plays were discovered among his mass of papers and manuscripts. Though Jonson left behind a financially depleted estate, he was nevertheless buried with honor in Westminster Abbey. William Shakespeare (1564-1616): An English dramatist often credited as the most important writer in the history of the English language. Miguel de Cervantes (1547-1616): A Spanish author often credited with having written the first novel, Don Quixote. Robert Ayton (1570-1638): A Scottish poet notable because he was one of the first Scottish authors to write in the English language. Guy Fawkes (1570-1606): The English would-be assassin of King James I, Fawkes has become a symbol for anarchy, notably in the graphic novel (later adapted into a film) V for Vendetta. John Carver (1576-1621): This Pilgrim leader was also the first governor of the Plymouth Colony, which is now mostly Massachusetts. Although later writers like John Dryden are often credited with innovating what we now call ‘‘literary criticism’’—a critical analysis of the merits, demerits, and meanings of any piece of literature—Jonson is now seen as the first major figure to work in the genre. Indeed, in both his published works and private conversations, Jon- son was willing to criticize both the poetic style and the personal lives of contemporary poets and dramatists. However, Jonson is notable because he attempted to hold himself to his own high standards, and in so doing, wrote poetry that utilized what has become known as a ‘‘plain style’’ of poetry. This style of poetry demonstrates Jonson’s artistic control and continued to be influential on poets for several hundred years. Jonson’s Criticism. 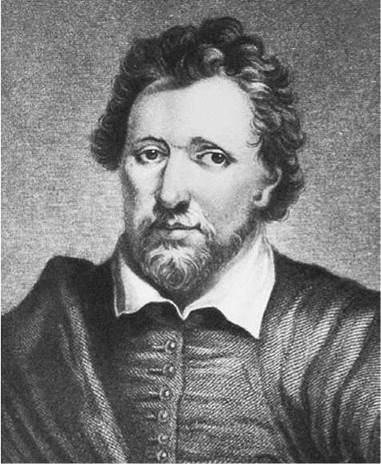 Poet William Drummond became acquainted with Ben Jonson and recorded a number of Jonson’s observations regarding poetry and poets of his day in his text Conversations. Drummond’s notes offer many insights into Jonson’s views of poetry and other poets. In one moment, Jonson memorably remarked ‘‘That Shaksperr wanted [i.e., lacked] Arte’’— one of several assessments of others that helped define his own ideals. He also said that some of Drummond’s poems ‘‘smelled too much of schooles’’—a statement balancing the one on Shakespeare by indicating that the art Jonson prized required skill but should also seem natural and unstrained. Timber; or, Discoveries (1641), one of Jonson’s most original works, in fact, represents the first English formulation of literary principles as applied through practical critical observation. In this he directly anticipated and influenced Dryden, commonly held to be the father of English criticism. Poetry as the Application of Principles. Ben Jonson’s significance as a poet is hard to overestimate. His influence helped transform English verse. His ‘‘plain style’’ made him a crucial figure in a central tradition, but his deceptively complex works reward close reading. Sophisticated, self-conscious, and strongly influenced by the Greek and Roman classics, his writing nonetheless rarely seems foreign or artificial. His vigorous and colloquial style exemplifies both wide reading and a deep interest in reality. Jonson’s ‘‘plain style’’ was neither artless nor utterly clear; instead, it avoids both sublimity and vulgarity. It was meant to communicate, to have an effect, and it gives his poetry a directness, practicality, seriousness, and force that loftier, lower, or more complicated phrasing would obscure. Its tone is often forthright, its emphasis ethical, although Jonson generally rejects priggish preaching. He mocked cant and jargon and usually avoids them himself. His poems—whether elegies, songs, celebrative verse, or short love lyrics—reflect a style of plainness and simplicity that he argued for in his criticism. Skillfully polished, such poems as ‘‘To Penshurst,’’ ‘‘Come, My Celia,’’ and ‘‘To the Memory of My Beloved Master William Shakespeare’’ exemplify the artistic control he valued so highly. Candide (1759), a novel by Voltaire. In his most famous book, Voltaire does not attack one writer specifically but an entire era of writers—writers from the Enlightenment, perhaps mostly Gottfried Leibniz—who argue that all that happens in the world will ultimately be for the best for all. Essentially, Voltaire rebukes this idea by putting his main character, Candide, through a number of trials, none of which turn out well in the end. Fenimore Cooper's Literary Offenses (1895), an essay by Mark Twain. Twain argues in his characteristically wry manner that James Fenimore Cooper, in a single page of his novel Deerslayer, committed 114 of the possible 115 literary errors a writer can make. The rest of the essay is equally biting. The Battle of the Books, and Other Short Pieces (1704), essays by Jonathan Swift. In this text, Swift pits ancient writers against contemporary writers and targets specifically a contemporary almanac writer, Partridge, and, in the process, the art of almanac writing itself for its ineffective methods of predicting, for instance, whether any given day will be rainy. Jonson was recognized as one of the foremost men of letters in his own time and at his creative height rivaled Shakespeare in popularity. Yet, his reputation soon declined; his plays in particular, though judged undeniably literate, were considered obsolete not long after their era, more exercises in scholarship than inventive entertainment. Modern-day appraisals of Jonson, however, have provoked a considerable resurgence of interest in his work. Dismissed as ‘‘No Shakespeare”. His earliest comedies derive from Roman comedy in form and structure and are noteworthy as models of the comedy of humors, in which each character represents a type dominated by some ruling obsession. Jonson’s later dramas, however, were dismissed fairly early on—most famously by John Dryden, who called them mere ‘‘dotages.’’ It was Dryden who first undertook an extensive analysis of Jonson. While generously likening him to Virgil and calling him ‘‘the most learned and judicious writer which any theatre ever had,’’ Dryden’s comments also signaled the start of a decline in Jonson’s reputation, for Dryden’s observations included a comparison of Jonson and Shakespeare—one that nodded admiringly toward Jonson, but bowed adoringly before Shakespeare. This comparison colored Jonson’s reputation for more than two hundred years, fueled by nineteenth-century Romantic critics, who found Jonson lacking in imagination, delicacy, and passion. A Resurgence among the Modernists. T. S. Eliot, writing in 1919, praised Jonson’s artistry, arguing that Jonson’s reputation had been unfairly damaged by critics who, while acknowledging his erudition, ignored the power of his work. He wrote: ‘‘To be universally accepted; to be damned by the praise that quenches all desire to read the book; to be afflicted by the imputation of the virtues which excite the least pleasure; and to be read only by historians and antiquaries—this is the most perfect conspiracy of approval.’’ With Eliot and the other proponents of literary modernism began a revaluation of Jonson, who benefited from modernist reaction against Romantic sensibility, and who began to be appreciated on his own terms. Workes in Contemporary Criticism. The late twentieth century has seen a renewal of critical appreciation of Jonson. Approaches to his work have come from a variety of directions and have taken many different forms, with many of them focusing on the Workes. For instance, literary critic Thomas Greene suggests that ‘‘in a sense, almost everything Jonson wrote attempts in one way or another to complete the broken circle, or expose the ugliness of its incompletion.’’ In contradistinction, scholar Mark Bland argues that ‘‘the idea of the Workes as a self-portrait, for all its immediate appeal, is not one that ought to be imposed upon that volume. No one would wish to deny Jonson his sense of identity or his voice; the Workes, however, has an ideal ethical form (like a masque), that seeks to engage and elevate the moral consciousness of the reader through its evolving structure—a process that is separate from the character of the author or the contents of the texts as such.’’ Whether we take the Workes as a self-portrait pointing to its own partialness or as a programme of moral edification, we are at the very least fortunate that contemporary literary criticism has again discovered the value of all Jonson’s works, collected or otherwise. 1. Read Jonson’s poem ‘‘Still to Be Neat.’’ The ideas in this poem are very similar to those in Robert Herrick’s ‘‘Delight in Disorder.’’ Read Herrick’s text. Which author do you think handles this subject more efficiently? Point out specific techniques that each author used that affected your judgment of the texts. 2. Read Jonson’s poem ‘‘On My First Son.’’ Jonson calls his son his ‘‘best piece of poetry.’’ Everybody has something that they consider their best work, and few consider their ‘‘best piece of poetry’’ to be an actual poem. Write a poem describing your finest achievement, following the structure of rhyming couplets that Jonson uses. 3. Read Jonson’s Poetaster and Mark Twain’s Fenimore Cooper’s Literary Offenses. Each of these satirizes authors who were alive and thriving when the pieces were written. In a short essay, analyze the kinds of criticism each author makes of his contemporaries. Would you say one picks on the author’s personal life more than his work? How would you say these differences change the overall effect of the pieces? 4. Read Jonson’s ‘‘To Penshurst.’’ This poem exemplifies Jonson’s ‘‘plain style’’ of writing and recalls classic literature with its epic themes combined with its earthy beauty. Choose a place you love—your house, a park, a zoo, a mall—and attempt to imitate Jonson’s plain style and the progression of descriptions in a poem in which you describe this place that is so important to you. Bamborough, J. B. Ben Jonson. London: Hutchinson, 1970. Barton, Anne. Ben Jonson, Dramatist. Cambridge, U.K.: Cambridge University Press, 1984. Champion, Larry S. Ben Jonson’s ‘Dotages’’: A Reconsideration of the Late Plays. Lexington: University of Kentucky Press, 1967. Chute, Marchette. Ben Jonson of Westminster. New York: Dutton, 1953. Ferry, Anne. All in War with Time: Love Poetry of Shakespeare, Donne, Jonson, Marvell. Cambridge, Mass. : Harvard University Press, 1975. Gardiner, Judith K. Craftsmanship in Context: The Development of Ben Jonson’s Poetry. The Hague: Mouton, 1975. Keast, William R., ed. Seventeenth-Century English Poetry: Modern Essays in Criticism. London: Oxford University Press, 1971. Leggatt, Alexander. Ben Jonson: His Vision and His Art. London: Methuen, 1981. Wheeler, Charles Francis. Classical Mythology in the Plays, Masques, and Poems of Ben Jonson. Princeton, N.J.: Princeton University Press, 1938. Bland, Mark. ‘‘Ben Jonson and the Legacies of the Past.’’ Huntington Library Quarterly 67, no. 3 (2004): 371-400. Greene, Thomas M. ‘‘Ben Jonson and the Centered Self.’’ Studies in English Literature, 1500-1900 10, no. 2 (1970): 325-48.